Does your club or organization schedule professional speakers from the community? Is your audience interested in learning more about law and the U.S. legal system? Look no further than the Judicial Speakers Bureau of the U.S. District Court. The Judges of the U.S. District Court of Eastern Missouri are available to attend your organization's meeting and lead a lively and informative presentation. 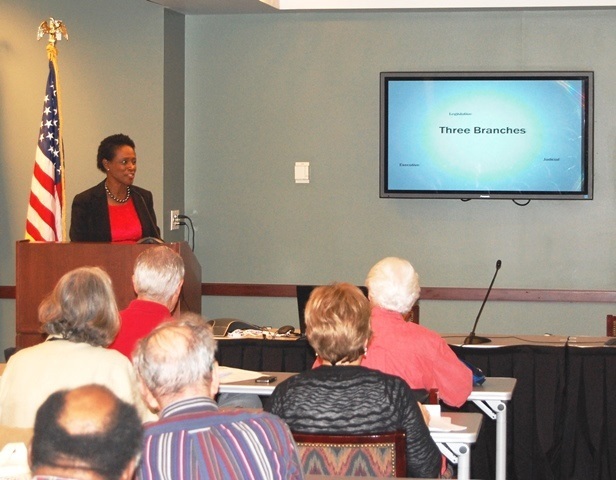 The Judicial Speakers Bureau offers free presentations, designed for adults in the community who might be interested in learning more about the courts, which appear so often in the daily news yet remain a mystery to many. A Federal Judge from the Eastern District of Missouri will attend your meeting, and lead an informative presentation. Time will be allowed for Q & A. Presentations can be adjusted to fit 30, 45, or 60 minute schedules. Talks can be tailored to your group’s interest, and will also include a basic introduction to the role of the federal courts in America. PowerPoint capabilities are requested, but not required. Guest speakers will travel to locations in St. Louis and the surrounding counties, including St. Louis, St. Charles, Franklin, and Jefferson Counties. Speakers may also be available to visit locations in and near Cape Girardeau County, by special request. Call the Office of Public Education and Community Outreach for more information and available dates. How is the judicial branch different from the other two branches of government? What is the difference between federal and state court systems? What are the kinds of court cases heard in federal court? Have any famous or important cases been tried at the federal courthouse in St. Louis?